JA Charity - our responsive Joomla template for Churchs and Charity - will not only breathe a new air into the interface of your church or charity organization's website, but also the unique experience for the users. JA Charity comes with a simple and vibrant theme design which is suitable for any charity organization, or religious institutions. It brings a contemporary design for organization that targets young and modern people. Generous is fully hand crafted, simple, flat and clean with huge features template which build by Warp 7.3 Framework. It’s specially design for non profit organization such as charity, child care, orphan, lorn etc. It’s have lot’s of possibilities you can easily change layout from admin panel even you can change any part of website with live preview. 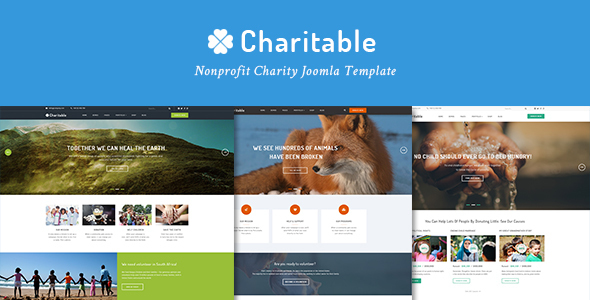 ZT Charitable is an elegant Joomla Template for Charity & Crowdfunding with predefined web elements which helps you to build your own site. ZT Charitable is suitable for charity, NGO, non-profit organization, donation, church or a fundraising website. 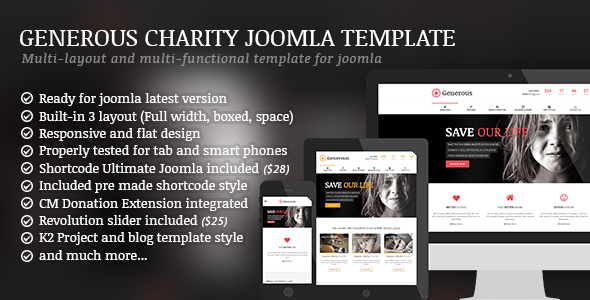 LT Charity is premium template tailored for non-profit, charity websites. It is 100% responsive, clean and stylish. The template comes with 6 colors schemes, but in fact it is really customizable, has drag and drop tools and color settings helping to create unique websites with various layouts. 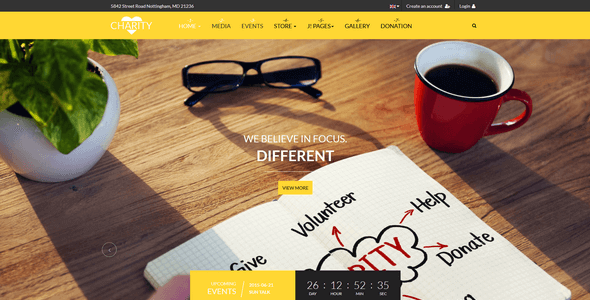 Vina World II is a free charity & non-profit template built on Joomla 3 CMS. This theme is great for any business, photography, portfolio or corporate company looking for a clean and minimal design. Aside from just looking beautifully polished and clean, it comes packed with features and options, powerful Helix Framework, 5 presets options, popular Joomla 3 Modules: Vina Awesome Image Slider, Vina Vertical Scroller for Twitter, easily configured various modules positions and a lot other best and selected extensions. 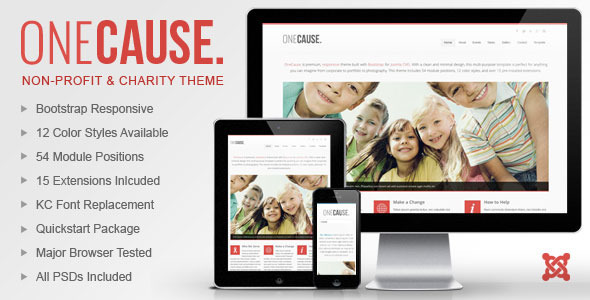 OneCause is a premium charity & non-profit template built on Joomla 3 CMS. This theme is great for any business, photography, portfolio or corporate company looking for a clean and minimal design. It includes over 15 pre-installed extensions in the quickstart package and boasts over 54 module positions. This three column layout is built on a responsive framework, and will dynamically scale many of the module positions equally depending on the number of modules published. There are 12 color styles available with this template.